somebody tell @foursquare I just ousted Allie as mayor of the kitchen table. I so rule. 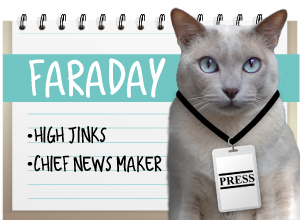 Faraday. Dude. Was that an attack on Momma's leg or were those jazz hands. Seriously. That was such an Allie move. 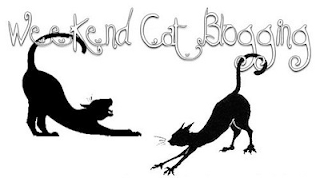 We're participating in the Weekend Cat Blogging blog hop! Have a super Saturday all. Love when you share your fave tweets... we vote for the first one by FaRaDaY... might be because Mom remembers that song! FaRADaY: okay, *maybe* I was yowling a little bit, but I was NOT swinging. And it was just a teensy crash. 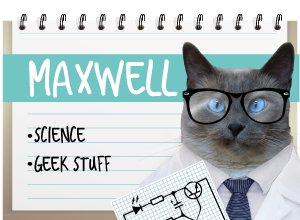 Maxwell: dood, it was MEMORABLE. We liked the "George" one too. But we cant forget what allus happened to George at the end of a long swinging session! Jazz hands definitely makes my favorites list! Have a super singing and sweet CATurday guys! MOL! Things are always pretty exciting at your place, aren't they? You guys are the funniest tweeters! Hee hee, those are great tweets! Hmmm... a couple of these tweets have very interesting behavior has some kitties been knocking down stuff from the counters. Twitter was made for the one liners and you are the best!!! 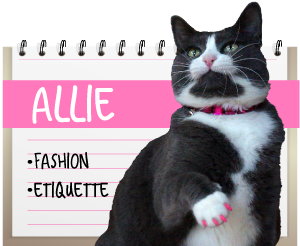 oh allie, good help is so hard to find! Nobody, and I mean NOBODY, tweets it like you guys. And Allie. Love your tweets. Too bad I have so much other garbage on my timeline that I never see yours.